All of Alex Senna’s murals are painted in black and white for one simple reason: he’s color blind. In every city he sets foot, from his hometown São Paulo to Mexico City to Tel Aviv, he leaves his monochrome mark. Alex paints humans. “It could be a poor guy or a rich one, it doesn’t matter,” he says. “What matters is the idea behind it.” The characters are embodiments of his thoughts and feelings expressed as lanky humans with facial expressions and emotive body language. They could be childhood friends or mixed-race families or lovers with arms interlocked. Sometimes their only company is their own shadow. They’re characters he’s gotten to know well over the years, some even manifest as older or younger versions of themselves as the years go by. In every piece a small bird, his signature, is perched on their heads or at their feet. Often Alex will create characters inspired by the towns they’re painted in and how people live there. In Civitacampomarano, Italy, an old lady in a head scarf makes her way to the shops. On another wall in the town, he’s painted a stray cat. A lone pianist plays to passers-by on the streets in Naples. He finds inspiration in the history of the walls he paints on, or in the texture, age, or the architecture of the building. Alex plays with proportion and perspective in his work, often painting his characters from above. “When you change your point of view, things start to change,” he says. His characters cast long shadows, sometimes taking on more personality than the people they fall from. The shadows represent his characters’ secret selves. Depending on his imagined light source, they have the ability to grow much bigger and stretch much further than the original figures. 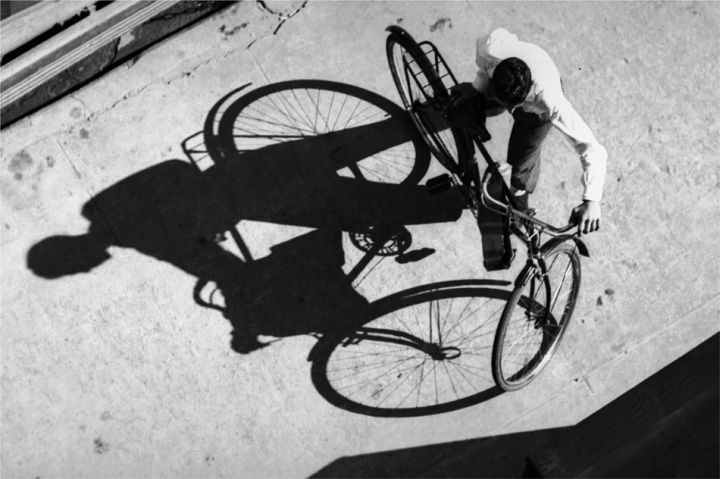 For example, one of Alex’s murals in Detroit is a tribute to a well-known black and white photograph by Brazilian photographer Thomaz Farkas of a young man with his bicycle captured from above , which creates a stark shadow on the pavement below. When you change your point of view, things start to change. No matter how many stories they tower over, Alex’s murals feel relatable on a personal level. His aim is to connect through capturing moments that everybody experiences. Street art, graffiti or any intervention shows that even in a very controlled city, you have people doing what they want. Although self-expression using the streets as your canvas can be seen as a political act, Alex says his works are not overtly political. Rather than respond to topical issues, he hopes his work will be timeless. He believes a subtle message can last longer, and so he focuses on themes common to us all.